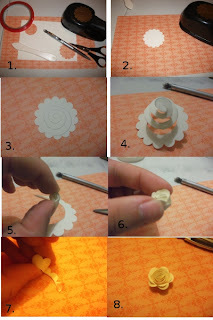 Supplies- Scrap Card stock 1 3/4" Scallop Circle Punch, Scissors, pencil, strong tape or glue, and a bone folder. Punch out a scallop circle, drag it across the bone folder a few times to make it easier to roll. Draw a swirl on the scallop circle. Cut on the line of your swirl. Starting in the middle, start rolling the cut piece in on itself. Put a small amount of tape or glue on the loose tail, hold in place. I have pushed the outer petals out a little to give a little more definition, then you're done! I then sat and punched just the leaves from three different coloured card stock from the two step bird punch. These were the glued onto the scallop circle, overlapping them slightly, to make it look full! Cardstock 1 piece cut at 6"x11"
Designer Series Paper cut at 3.75" x 3.75" and 0.75" x 3.75"
1. Score your cardstock at 1" and 5" on the short side. 2. 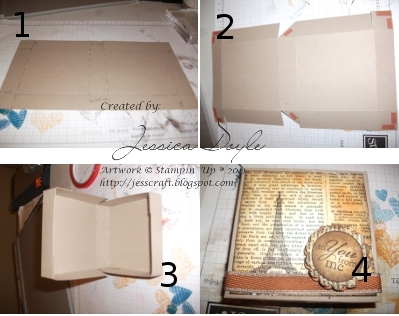 Turn your cardstock long ways and score again at 1", 5", 6" and 10". 3. Cut along the score line at the corners and in the middle. 4. Fold along all score lines, and adhere tape to the corners being folded in. 5. Adhere edges, and decorate.